In this collection of three whimsical and fresh stories of romance in unusual settings, Karen Ball’s writing will delight readers of all ages and in every season. 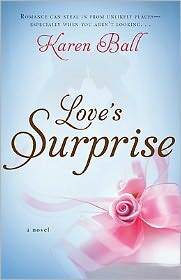 Infused with love, tenderness and humor, the stories are threaded together with common characters and themes.The protagonist in “Valentine’s Surprise” has been unlucky in love, so her sisters conspire and set her up with a blind date they’re sure will be “The One.” The date is surprisingly successful…until she discovers she went out with the wrong man!In “Jericho’s Walls,” a widow’s grown children try to forestall her annual April Fools’ Day depression. They trick her into pet-sitting a ferret, and talk her into a major house renovation–to be done by the good-looking but distant Jericho Katz, whose spouse also has died. But can you help someone who doesn’t think she wants it?”An Unlikely Angel” is the story of a very successful lawyer who believes he’s got everything he wants and needs in life. Then a charming but destructive Siberian Husky turns up. The man comes to learn what is truly valuable, with help from an even more charming and quirky girl-next-door, and the gentle nudge of…an angel?